The Art Activity Easel is made of hardwood for your confidence of strength. It's the perfect art supplies for children addition to any childs studio. 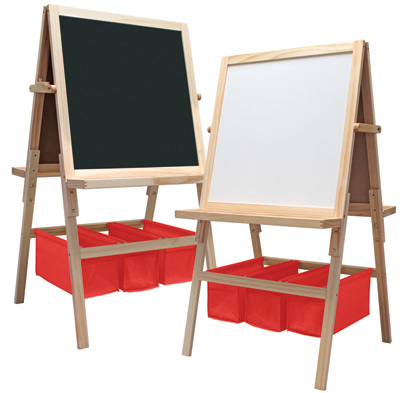 This child's easel includes large trays on both sides and generously sized 23-1/4" x 23-1/4" dry erase white board and chalkboard surfaces. It also has a hidden paper roll that feeds over either side. Replacement rolls sold separately. It can be converted to a table top easel with attached rubber feet for surface protection. The adjustable legs accommodate users of different heights or can be adjusted from 46" to 54" as the young or vertically challenged artist grows. The sturdy, washable bright red baskets provide convenient and ample built-in storage space. Light assembly required. A top seller in our chicago art supply stores. Base dimensions are 26-1/4"W x 23"D. Table top dimensions are 26-1/4"W x 31-1/2"H x 15-1/4"D. Weighs 37-1/2 lbs.